Babyjorn Carrier One is a versatile carrier which is an upgrade from the previous Babyjorn Carrier Original version. A lot of complains are based on the fact that the BabyBjorn is not ergonomic and a crotch-dangler. With this carrier BabyBjorn has tried to beat that opinion. They claim that the BabyBjorn Carrier One is completely ergonomic. But most parents agree that it is ergonomic only in certain positions. It offers 4 carrying positions and is designed for children up to 3 years of age. The carrier is not moderately priced but offers some useful features which make babywearing easier. There are many different reviews about this carrier which are both positive and negative. We are offering an extensive review to help you make up your own mind about whether or not this carrier deserves your attention and the money you spend on it. Let’s start with a quick look at some advantages and disadvantages of Babyjorn Carrier One. Permanently joined straps allow the parent to easily put the carrier on over their heads. This is especially useful for fathers whose large hands often have trouble with clipping the buckle in the back. Signature buckles make the baby in and out transfer easy and quiet which is especially useful when she is asleep. It is very easy to switch between positions. No extra infant insert required to accommodate the smallest babies. Comes in a wide range of different colors and has the light version ‘Air’ for hot weather and ‘Outdoor’ version for active parents. Standard: black, denim/dark gray, denim blue, coral crab and black/silver. The BabyBjorn One Air comes in silver, black, brown, ice-blue fish and dark blue. BabyBjorn Carrier One Outdoors comes in turquoise and black. Has 4 different carry positions, including the outward facing position and back carry. While being a little bulky (it weighs 2,1 lbs), this carrier can be folded very compactly. It is so easy to use and has handy instructions sewn into it so you don’t need to keep referring to the user manual as your baby grows. It’s so quick to get on and baby into it and off you go. I’ve used it so much more than any other baby carrier I’ve owned in the short time I’ve had it purely due to it being so easy to grab and go and the fact both me and my baby are so comfortable in it. It also folds down nice and small so always on hand in the car or buggy for when my baby wants to be held close. For some women the front straps can cover the breasts which makes breastfeeding very difficult, uncomfortable and not very discreet. A low weight limitation doesn’t allow for carrying heavy toddlers which means parents will need to buy additional carrier as the baby gets older. Large buckles at the baby’s head height makes the baby constantly hit her head or face on them depending on the position. In the front position the head support doesn’t fold down properly and can hit the baby’s face. This carrier lacks the common useful features such as sleeping hood and storage space. Breastfeeding is not very easy. The baby is very upright with little wiggle room, and if I need to start loosening straps and un-connecting snaps I would rather just remove the baby from the carrier altogether. Plus There is a mesh screen separating their belly from mine making the task quite difficult but not impossible. Easy position switching – The carrier is designed in a way to allow easy front to back position switching which can be done with just one hand. Zip system – The zip feature allows to adjust the way your baby’s legs are positioned. If you open the zipper, the legs will dangle. If your close it, the legs are supported which allows for the ergonomically correct M position. A bib – Protects the top part of the carrier so it doesn’t have to be washed too often. This feature is sold separately. Carrier cover – Offers protection for the baby from the sun and the rain. However, it needs to be purchased separately. Babyjorn Carrier One is made out of sturdy material. The stitching is very precise and the carrier itself is solidly constructed which makes it appear very reliable. The carrier is 60 % cotton and 40 % polyester. There are special vent holes to make the baby comfortable during the cold season. The material is soft yet durable which makes the wearing pleasant for both the parent and the child. For extra protection the manufacturer offers a carrier cover with detachable hood which is made out of breathable fleece. However, it must be purchased separately. 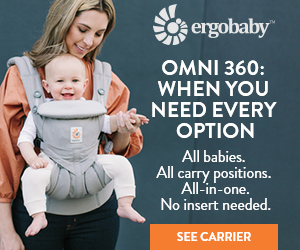 This carrier offers four baby carry positions, including the back carry and outward facing position which other carriers often lack. It is easy to switch from front position to the back without taking the baby out of the carrier. Inward facing position – The most popular position which can be used from the infancy. The head support does a good job holding the baby’s head. The seat can be widened a little to allow older babies to sit comfortably in this position. Outward facing position – A perfect position for babys who like to see where their parent is going. It is created for babies older than about 6 months, who can hold their heads and control their muscles well. However, some parents reported that the baby wasn’t held tight enough in this position. Back carry – A popular position for older children. The baby is safely seated in the back which allows the parent to move around even more freely. I would love this because your baby can face in or out on the front or back! I haven’t found a baby carrier that comes close to that besides the Boba 3G which has three positions. 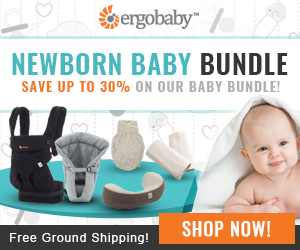 Baby Bjorn is also a quality brand and their products look stylish as well as functional. My husband actually likes this one too (we don’t always agree on carriers). Babyjorn Carrier One is made out of safe tested materials. It offers four carry positions. The buckles are designed so parents hear a special click to know that the baby is safe in the carrier. The manufacturer claims that Babyjorn Carrier One was acknowledged as a hip-healthy carrier by International Hip Displasia Institute although many parents agree that BabyBjorn has not yet achieved 100% ergonomic carrier status. The Bjorn is ergonomic and the base reaches knee-to-knee only in certain positions with the base on wide setting. When the base is unzipped (in front-facing and newborn carry position) the Bjorn is not ergonomic. It should be noted though that Bjorn has definitely made a lot of improvement. As you can see above with the base unzipped the Bjorn is still a crotch dangler. 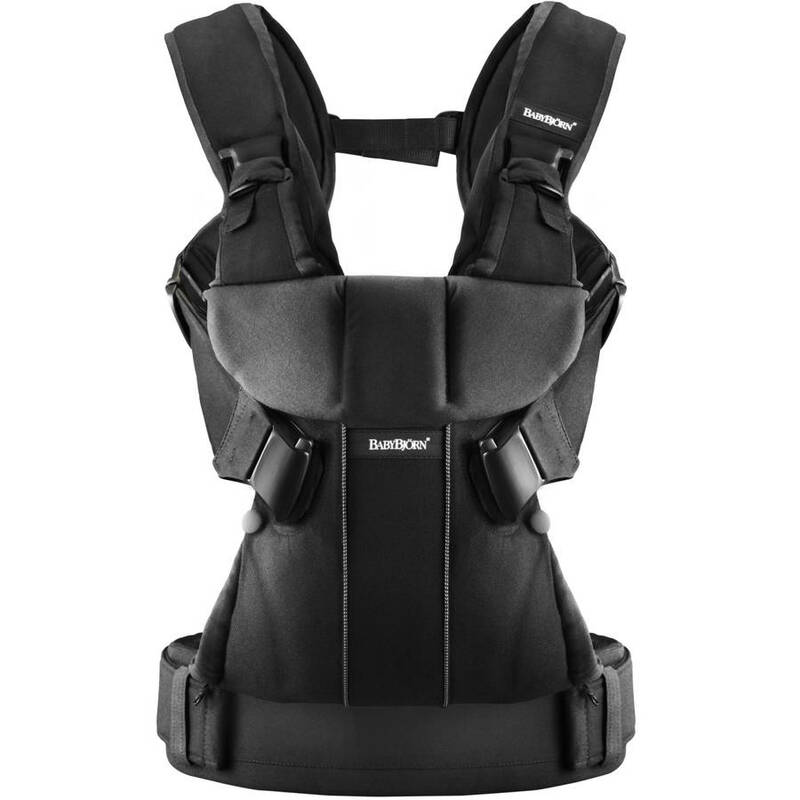 This carrier got good reviews for the infant’s comfort and not-so-great reviews for the toddler’s comfort. It seems as if the carrier was designed to cater to smaller babies only. As the baby gets heavier, it gets less and less comfortable for her to fit into the carrier. The legs are dangling and the seat is not wide enough. Infants mostly feel good in the carrier. Many moms reported that their children easily fell asleep in it. However, large buckles that tend to hit the baby’s head don’t make the ride too comfortable. At he same time the head support doesn’t fold down properly which makes the front carry position a bit uncomfortable for the child since the support can pop into her face. While the absence of the back buckle makes it easy for fathers to put this carrier on, the learning curve of the carrier is not as low as some parents wish it would be. Learning how to put this carrier on will take some time. At the same time petite moms reported troubles with wearing the babies correctly. This carrier seems to be designed for tall parents. If the parent is not tall enough, the baby hangs too low which will leads to poor weight distribution. This gets especially uncomfortable when the baby gets heavier. Another unfortunate problem of this carrier is that it’s not designed for easy and discreet breastfeeding, which makes it very uncomfortable for the parent. Also the absence of storage pockets will force parents to carry extra bags with them. For parents who are tall enough this carrier will seem comfortable. It offers padded straps for soft wearing and a waistband for better weight distribution. The back carry position gives parents extra freedom of movement. The Babyjorn Carrier One is machine washable. However, the cotton part and the mesh component of the carrier have different washing instructions, which makes it a little complicated to wash and takes up a longer time. Unfortunately you cannot use the dryer for Bjorn so you would have to air dry it. This is a little inconvenient as sometimes you need a ‘quick wash’. This baby carrier can be used whenever and wherever. Besides the standard BabyBjorn Carrier One, Bjorn has come up with Outdoor and Air models which are made for a more active lifestyle and hot weather respectively. However, most parents agree that this carrier is good mostly for infants and younger babies. Once the baby gets older, it becomes harder to wear and parents need to switch to other carriers. While the baby is small, the carrier can be used for all kinds of purposes, including walks in the park, lengthy travel, shopping in the mall and common house chores. The carrier is well-ventilated which allows the parents to use it in warm climates. Every day, I wear the Baby Carrier One as I go about my usual activities. I read stories to my little boy, type out work emails, set my hair in curlers, and do the laundry without interruption. Without the Baby Carrier One, I struggled to accomplish even one of these tasks. Should I Buy BabyBjorn Carrier One? Babyjorn Carrier One is an obvious improvement from the Original version. It has four different carry position, which is a great advantage for the parents. The front facing and back carry positions are very popular. The switching between front and back position is quick and simple. The straps are padded. The waistband offers additional comfort and proper weight distribution. However many parents complain that the weight sits on the shoulders rather than the waist and if baby is heavier or when the baby gets older this becomes a huge problem as you start getting terrible back ache. BabyGearLab.com mentions that this problem is caused by the carrier being too long-waisted. Unless you have a very long torso, baby sits too low causing the weight to be primarily distributed to the shoulders rather than the hips. This carrier is made out of sturdy material which is easy to wash and spot clean. The vent holes offer additional ventilation for both the baby’s and the parent’s comfort. The carrier is put on over the parent’s head which makes it simple for fathers who have trouble dealing with the back buckle in other carriers. The zip system allows the parent to choose the way baby’s legs will be positioned. However is does not offer the correct ergonomic position when in front-facing position. This baby carrier doesn’t have many additional features and most of them are sold separately. It might not be suitable for petite parents as they cannot adjust the carrier so the baby sits close to them and is secured properly. Large plastic buckles sometimes hit the baby’s head while wearing and the head support can pop into the baby’s face in the front-facing position. The carrier is designed for babies not older than 3 years old which means the parents will need to purchase a separate carrier for their toddler. Overall, this baby carrier can be recommended for children up to about 12 – 18 months old. Once the child gets older, many different problems arise, such as improper weight distribution. We can recommend this carrier for parents with infants, who are ready to spend extra money on features and another carrier for toddlers. Also we do not recommend this carrier for petite parents and heavier babies. BabyBjorn as has come a long way and has bee n much criticized for not being an ergonomically correct carrier for allowing baby's legs to 'dangle' as opposed to putting them in a frog leg position. So BabyBjorn has come out with BabyBjorn Carrier One which has been approved by Hip Dysplasia Institute. This versatile carrier features 4 carry positions, can be used from birth without additional insert and is very easy to put on. It comes in many different colors and features various designs for parents-on-the-go and hot weather conditions.